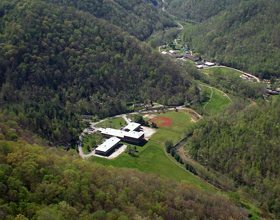 Red Bird Mission, in the heart of Appalachia’s Cumberland Mountains, serves a remote area in Bell, Clay, and Leslie counties in southeastern Kentucky. Access to the region is sometimes difficult depending on the weather and time of year. Public services and infrastructure are virtually non-existent. The small towns that are county seats range from 25 to 35 miles away. Public water is inadequate and there is no public sewer. Telephone and electricity service is unreliable during bad weather. In Clay County (the poorest county in Kentucky), 45.9% of all children live under the poverty level, and over 69.9% of single mothers and their children live in poverty. In Bell County 26.4% of families live in poverty. Leslie County is similarly economically distressed . The Census also found that the three-county area is undereducated. In Clay County, for example, 41.2% of adults over 25 did not complete high school. Red Bird Mission is the local coordinating agency that refers families in need and distributes groceries purchased by Family-to-Family donating families. Red Bird Mission is a National Mission Institution of The United Methodist Church. Since 1921, it has provided educational, medical, and community outreach programs for residents of the Red Bird River Valley. In addition to its regular sponsorship program to help families living under the poverty line, Family-to-Family also supports “The Gap Pantry” at Red Bird Mission, which provides food to struggling families with incomes just over the poverty line. Through this sponsorship program, low income, working families can “shop” (no funds needed), for the foods they most need at the “Gap” pantry. Read more about “Gap” family sponsorship here.